Ephel Duath’s Davide Tiso has formed a new band, Howling Sycamore. The extreme prog outfit is fronted by Jason McMaster (Watchtower, Dangerous Toys) and also includes drummer Hannes Grossmann (Necrophagist, Obscura). Tiso gives us the lowdown on his new group. Chad Bowar: How did you put together the lineup for Howling Sycamore? Describe the songwriting process for your self-titled debut album. Davide Tiso: Howling Sycamore is a project that started in June 2016 when I was asked to write guitars for the extreme metal band of an acquaintance. The drum parts for the project were already recorded with defined structures and accents. I was used to writing songs starting from guitar ideas. Having only drums to rely on forced me to use a completely different point of view when writing my parts. The material composed pleased both parties but it didn’t really fit with the project it was intended for. I felt that the songs could have grown into a much more ambitious project and I decided to use those guitars to start my own band. Reconfiguring the band based on the guitars that I had already written, I thought it was necessary to keep the extreme metal drumming angle but strongly felt that the singing was not supposed to be a screaming or growling style but closer to old school heavy metal. Having the guitar ready, at first it was a matter of finding the right drummer to lay down a solid foundations for the songs. After few weeks of scouting, I approached the amazing Hannes Grossmann to play drums on the album. The first time I saw him in action it was 2003 when Ephel Duath shared the stage with Necrophagist at Brutal Assault Festival in Czech Republic. When contacted, Grossmann was excited about the project and ready to learn the material. After a few weeks he started recording at his own studio, Mordor Sounds, in Nuremberg, Germany. Once I got the final drums I wrote the bass parts based on the drums’ feel and re-arranged some of the guitar parts. Scott Evans (Antisleep Recording, Oakland, CA) had the idea to contact the ex-Watchtower singer Jason McMaster. I saw McMaster in action years before, when Watchtower and Ephel Duath were in the same bill at the 2004 edition of Holland’s Headway Festival. McMaster accepted to sing for the band after listening to a guitar and drums pre-production and recorded his parts at his own home studio. It took approximately a year to record the voice, re-record guitar and bass and mix the album. During this time some special guest musicians had the chance to contribute to the songs: Bruce Lamont (Yakuza, Brain Tentacles) on baritone saxophone, Kevin Hufnagel (Dysrhythmia, Gorguts) on guitars, Fester (Burials, Humorous) on guitars. I was always fascinated by the symbolism of the sycamore tree, which had special significance in Egyptian religion and which “bridged the world of the dead and the living” in David Lynch’s cult TV series. Visually the sycamore is particularly striking in winter when it gains a ghost like appeal: the bark turns white and it reflects the moonlight in otherworldly ways. To me, sycamore in winter bears not only mystery but also a certain component of solitude and pain, a human-like kind of pain. Hence the idea of a sycamore tree howling and the will to use that image to lyrically set the mood for this band and as title for our debut. How did you decide to work with producer Scott Evans, and how was the experience? I first got in contact with Scott Evans through a post in a Bay Area Facebook group: he was selling an amplifier I was interested in. We met at his studio, I tried the amp and bought it. We had the chance to chat a bit and we stayed in contact. In the months that followed I listened to his productions and I decided I was going to work with him for my next production. When Howling Sycamore’s pre-production started I contacted Scott and from that moment on he has been involved in every step of the production, until the final master. Scott Evans productions have wonderful natural sounding tones, they are powerful but never forced. His mixes are so elegant, and they maintain a certain element of rawness that to me is absolutely necessary to express what Howling Sycamore is. Working with Scott has been great. His patience and talent largely contributed to the positive outcome of the album. Watching him adventurously dealing with pedals during my guitar sessions has been truly eye opening. What will be your strongest memory of the recording of Howling Sycamore? The moment I realized that the album was eventually going to come out as I hoped for. For a few months the Howling Sycamore sound was just an idea in my head. When, little by little, month after month, every band member contribution was falling perfectly into place, I felt that that sound in my head was functionally turning into a reality. I feel such gratitude to all the people involved in this debut, and I’m very proud for what reached thus far. More to come. 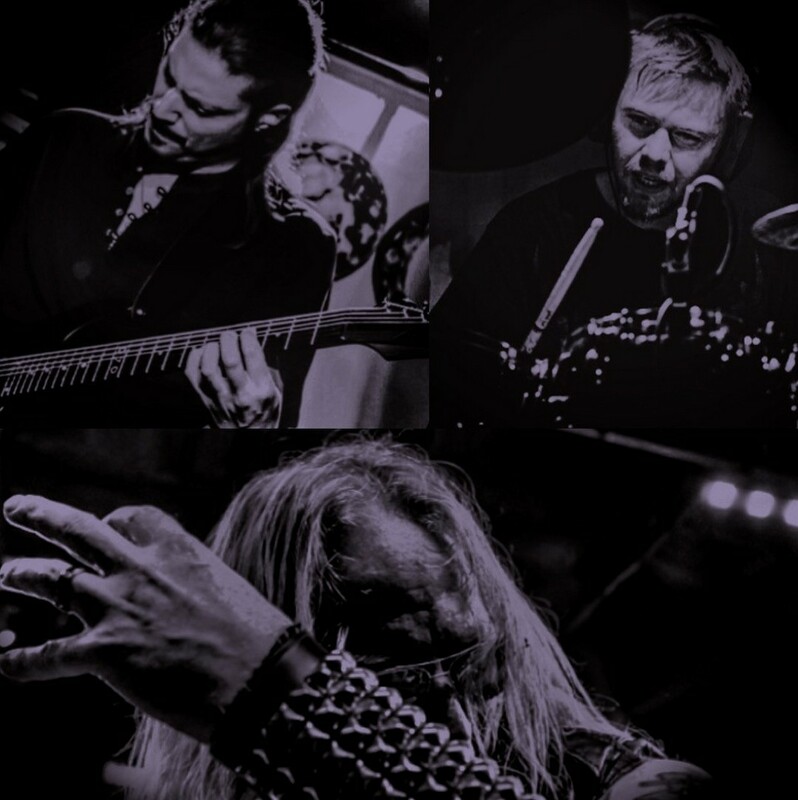 Howling Sycamore was born from the stubborn will of putting together extreme metal drumming, layered, down-tuned guitars and old school heavy/prog metal singing. What did Bruce Lamont’s contributions add to the album? I think brass instruments played with a forceful attitude are simply terrific when applied to extreme music. It was 2003 when I started including brass instruments in some of my songs and I’m excited to take that route every time a piece I’m working on calls for it. Bruce Lamont did a terrific job playing baritone sax on two songs in the Howling Sycamore debut: “Upended” and “Obstinate Pace.” On the first song I asked him to make three appearances. I asked him to make the sax scream, hitting high pitched freak outs to create a call and response with Jason McMaster’s parts. On the second song I asked Bruce to do an elegant, smoother solo towards the end of the song, where my guitars go into a layered, somehow uplifting, long mantra. How did you come to sign with Prosthetic Records? The day I received the final master, September 6th, I uploaded it on a private Soundcloud link and sent it around to labels, together with the cover artwork’s first draft and a bio. Prosthetic Records contacted me right away and offered me to put out the album by the end of January. Less than a week after I signed a three album deal with them. It has been a very fast and easy process. We clicked immediately. I’ve followed Prosthetic Records for years, it was a no-brainer. There is a certain common denominator among most of the bands that this label has put out thus far. They are pushing boundaries, guitar driven and technically proficient. I feel Howling Sycamore fits in just right. My expectation for Howling Sycamore debut is to start the process of building an audience for the band. I would love for our first album to reach a good amount of engaged music enthusiasts that will follow and support our next steps as a band. Do you have plans to play live? Yes we do and I’m actively working to make that happen. I got a rehearsal place for the band, bought some new equipment and I’m currently putting together a live lineup in order to play shows. My goal is to start around spring/summer 2018. How did you come to join Aborym? I never did. I recorded some guitars for their last album and my name appeared in the band’s lineup because my contribution was a bit more lengthy than a mere guest appearance. Fabban and I are good friends for many years, I’m so proud of him for keeping pushing the band towards new territories, album after album. What’s the status of the next Gospel Of The Witches album? Karyn Crisis just released a book called Italy’s Witches and Medicine Women Volume 1. She’s currently promoting it with lectures around the US. For more information go here. Whenever the time will be right the second Gospel Of The Witches album will come out. It’s an amazing record, definitely the best thing that Karyn and I composed together. Pallbearer. Their last album’s sound is really phenomenal. I saw them live opening for Gojira and they were impeccable. Om, especially Advaitic Songs. This band put me in such a positive reflective mood. Nothing but good vibes. Wardruna, pretty much any album. I love to listen to these masters of charged minimalism when I ride my bike to the ocean. Power Trip/Necrot/ Gatecreeper: to give me the kick in the morning that I need to start my day right. Jaco Pastorious/John Coltraine – listening to these two geniuses simply feeds my brain. Black Sabbath (Dio era). In these past few weeks I’ve been promoting Howling Sycamore and doing quite a few written interviews. The combination of Dio’s voice and that magic Tony Iommi’s guitar keep me line and makes me work harder. I’m currently writing Howling Sycamore’s second album. I plan to start the recordings by the end of 2018. I already have a lot of material that I composed starting with the guitar. I’ll add some other songs composed on pre-existing drums, like we did on the debut. We will work on that during the upcoming spring. I foresee the album going towards a more prog/experimental/polyrhythmic direction. To listen to some extracts from the album and to order it please go to our Bandcamp page. Thank you for the interview and the support!